Finding one 30-ton grey whale [image] in the vast North Pacific might be like looking for a needle in a haystack, but finding 17,000 shouldn't be. But that's the situation researchers faced while searching for the creatures in their traditional summer feeding grounds last season—and the whales' absence has them concerned. "We've just come off a second summer in Canada in which we've had next to no whales show up," said William Megill of Bath University in the UK. "Not only in our little area, but apparently throughout the traditional feeding areas from Washington on up north. We have no idea where the whales all went this year." Fresh on the heels of the tarter sauce catastrophe - - stocks of “all” protein laden autonomous algae munchers are on track to collapse within fifty years - - comes the news that “some” of our mammalian kin apparently are struggling now. The cold wind of irony blows. Perhaps they’ve gone to hell, beating our generation out the door. Perhaps a starship captain has transported them back to the future to prevent our solar system from being destroyed by glitter. One can well imagine a small population of grey whales bleating their last bleats as a Japanese whaler runs them down. It hurts when 17,000 whales go missing, but at this stage it is merely the tip of a rapidly melting iceberg. Our human problems should be considered solvable, if addressed. Can anyone honestly say that the problems are being addressed in a systematic and courageous way? Are we in the West sacrificing any aspect of our polymer coated lifestyle to lay the groundwork for a richer, fuller, more humane culture for our successors? Hell no. At best, each of the interlocked problems mentioned above compete for attention separately, and desperation programs are embarked on to pseudo-address certain of them while a jet setting existence is maintained. An excellent example of this is the imaginary money being spent on imaginary liquid fuel. Now is a great time to get in on this ponzi scheme, as unicorns and rainbows dance in the eyes of technocrats. I’m convinced that publicly traded ethanol producers will see their paper stocks soar to the moon, POW, at the first major burp in the traditional oil markets. These global problems cannot be effectively addressed separately. Solving problems must then become our industry, the artifact we produce as a human race. One hundred years of directed attention ought to do the trick. The consumerist, globalist myths of our age need be beaten into gravel and dust, pronto, before humans become the creation myth of cockroaches. When tallying up what must be saved, fish are the top of my list. That’s our brain food, right there. One can readily imagine that some time after we run out of Omega Three, names like “Og” and “Biff” will shortly come into common usage again. Polysyllabic words are for nerds and stinky fish eaters. In that area, Crawford and Marsh were ahead of their time in proposing that human encephalisation (evolutionary brain growth) could not have happened in environments which were poor in brain specific nutrients, such as on the African savannah. Their thesis was, from the beginning, that this remarkable phenomenon could only have feasible happened on coasts, or at least in waterside habitats rich in essential fatty acids like DHA. More recently, Crawford (has) been part of a group of nutritional biochemists, including Stephen Cunnane and Leigh Broadhurst which has published a number of papers promoting a link between human encephalisation (the evolutionary trend to larger brains) and proposed increase in the use of coastal food chain. I have just been reading a book "1491" concerning the state of native civilization prior to Columbus' arrival. In the book he talks about some of the ancient Peruvian civilizations that developed huge complex irrigation systems that totally modified their environment. The interesting thing is that it wasn't for food. Their diet was almost entirely seafood. The irrigation was for cotton. Textiles were the thing. But in general this author claimed that the majority of native civilization prior to the arrival of Europeans was near water and they definitely depended on the fish. Could the ancient Europeans and Africans have done much different. By the way, Jon, I have spun an energy-only blog off of CybeRedoubt. I have called it Petrophy. It isn't much yet but I hope you have a chance to stop by sometime. Gav - Yeah those are my favorite "hitchhiker" covers. 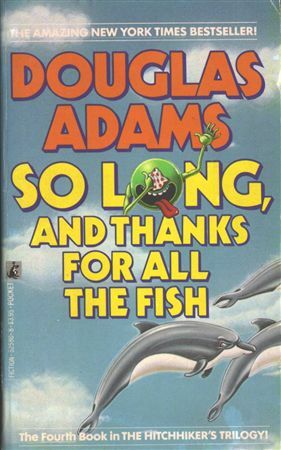 Maybe because they were the ones I read first, but it is hard for me to resist smirking dolphins. Bill, I'm more worried about the oceans right now than just about anything. We're committing pan-racial suicide, on a very visceral level, blood and guts, when we start to deplete this "resource"
even the word "resource" is loaded. responsibility might be better. Reading your blog gave me an idea. if there comes a time when there is no more oil then people will be raised in an enviroment where there will be no car or truck that pollute the way they do at present. Thus big factories would then become the biggest producer of bad things that go in the air and water. Now if there were only some way to get people to think differently in the here and now?? ?